G-Trigger is a G-Sensor based shake detector application. It allows to start an application on shaking your Touch Diamond in particular direction. It will trigger the specified action when phone is forcibly moved from left to right or moved as above mentioned directions. You can now add exceptions too. 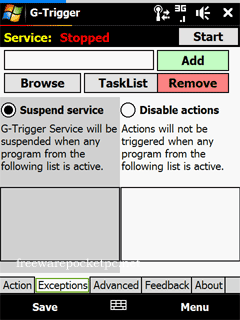 G-TriggerService will be suspended till the program specified in exceptions list is active. - OSD is displayed with some delay after event is occurred. - Sometimes shake actions are not triggered when device is busy processing. - Action Media Control "Stop" does not work for all players. - Media controls for "Pocket Player" works till it's window is active or minimized (not working when in notification mode). 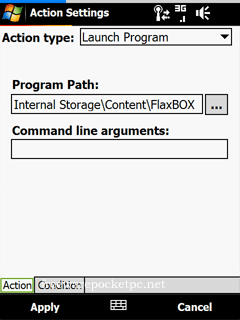 - Display configured actions as OSD when device is lightly shaked. - Add more actions like "Navigate Manila Page", "Open Quick Launch" etc on shaking. It is developed for HTC Touch Diamond. I have not tested it on any other device. Let me know if you try it on other device. Although running this application does not seem to make any damage, I take no responsibility for any kind of damage caused to the device or data due to this application. - Transfer .cab file to any location in device. - Run the .cab file and install application to device storage. - Run the "G-Trigger" shortcut from programs. - Click "New" button on "Action" tab. - Enable the check boxes for the actions you want to activate. 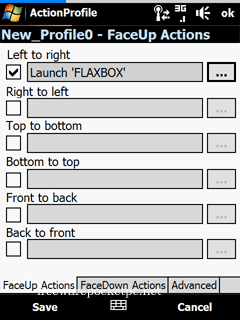 - Assign any action by clicking "..." button on the right side of action text box. - Click "Save" button on edit profile page, again click "Save" button on main page. - Click "Start" button to start the service. - Shake your phone and enjoy! - Fixed: Null reference bug on fresh installation. o Save Screenshot (BMP/JPG/PNG/GIF at predefined location). o Change Wallpaper (Today Screen, Manila Home & S2U2). o Show/Hide/Toggle On-Screen Keyboard (SIP). - Added: Added option to enable/disable debug logs. - Added: Lower threshold value up to 5 for front-back actions. - Added: Profile priority setting for auto-trigger profile option. - Added: Included new samsung SDK for G-Sensor in setup. - Fixed: Unable to detect screen is off on certain devices. - Fixed: Auto Start Service on device boot up issue (introduced in 0.8.0). - Fixed: Few minor bugs. - Fixed: Repeated debug logging like "There is something wrong with g-sensor! Lets refresh the sensor!". - Added: Different actions for shaking device when FaceDown and shaking device when FaceUp. - Added: New user interface for organizing profiles with ease. - Added: Auto-trigger profile option "Manila music is playing". - Added: Import/Export settings and/or profiles. - Fixed: Samsung Omnia G-Sensor code to sort out issue of service crash after device is awake. - Fixed: Auto-resize configuration utility dependent on resolution. - Fixed: Faster editing of shake actions after opening edit profile once. 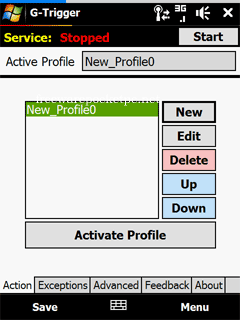 - Fixed: Modification to profile actions no more required to hit save button to make it active. - Updated: Slight modification to shake algorithm to make front-back action more sensitive. - Updated: new registry location �HKCUSoftwareKnepsG-Trigger� (you will require to delete older location �HKCUSoftwareG-Trigger� manually, I apologize for this). It would also be great to have a smooth repitition feature for the directional setting to be able to scroll or pan. HTC TP2. WM6.5: I think I love this app. It works well. I wish I didn't have to shake so hard, people keep asking me what's wrong or what I'm doing...haha. It would also be great if it had a tilt feature. I really like that it has an optional display; it helps me learn how exactly to shake my phone and remember what I associated with each direction. All around great app. works super on my htc hd2. excelent application. does it work on omnia2? AWESOME program. works great on my omnia 910 except it gets a error when i hang up after a call and i have to restart the service?